My family will be visiting from India, so, for the next two months, we'll be traveling around the United States while I do some decompressing. Then I'll start a job here, in Atlanta, at Ernst & Young, as a program portfolio manager. First of all, I'll be traveling and meeting different people, from different places. One of the most exciting things is that I will be applying the knowledge and technical skills I learned at Tech to advise clients on the technologies they should pursue to optimize their projects. To get the most bang for their buck. And I will be consulting with clients from diverse fields - not just aerospace - using advanced problem-solving skills in a new way. I completed two internships as a part of my master's program at Tech. I did two rotations at Gulfstream in Savannah [Georgia] where I did hands-on verification and validation of cockpit systems. During my Ph.D. program, I interned with the FAA where I did research on a couple of different projects to improved the safety of commercial aerospace operations. All of my research and internship experiences at Tech -- and work in ASDL - gave me valuable exposure to different managers and leaders. They also exposed me to problem-solving in a variety of contexts - electric vehicles and aviation safety, to name a couple. All of this opened me up to the possibility of consulting in different fields - outside aerospace engineering - where I could apply my knowledge to different problems. I don't think I would have ended up in consulting if I hadn't been exposed to the educational experience I had at Tech. The classwork gave me a solid foundation in technical skill, engineering. From there, I emerged with more confidence about succeeding in different settings, using that same knowledge to solve different problems. The AE School gave me the opportunity to get involved in other areas, like cultural organizations. 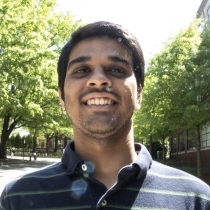 I was actually able to be a Sam Nunn Scholar, join SAESAC [School of Aerospace Engineering Student Advisory Council] and serve on the board of the Georgia Tech India Club. I come from a hard-core technical school [India Institute of Technology] where I didn't have exposure to so many things outside of academics. My number one piece of advice would be to make sure you are competent in your academics and in your research skills because they will teach you about more than the particular problem you are working on. They will let you expand to other areas. Still, there are a ton of other opportunities at Tech that you owe it to yourself to explore. My experience on the India Club and in SAESAC gave me an entirely different perspective that I will really need once I step completely out of the bubble of graduate school.